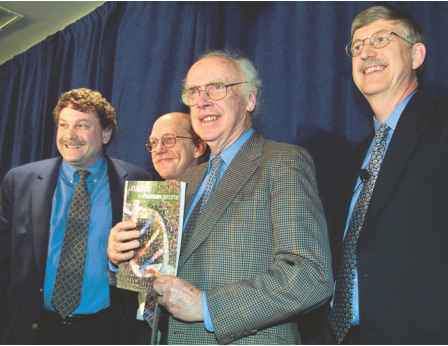 At a 2001 press conference, founder of the Human Genome Project, Dr. James Watson (with a copy of Nature in hand) announces the successful completion of human genome sequencing and poses with key supporters for photographers. government-sponsored projects. In 2001 the first draft of the complete human genome was published. However, considerable work remained to be done, particularly in the sequence of regions of repetitive DNA.